If we want to burn two gasses, we have to mix them first. Therefore, mixing usually determines the rate of combustion. Even if we premix the gases, such as in an automobile engine, the reaction rate is still often limited by the mixing of heat from the source of ignition. So understanding mixing is a first step to understanding fuel efficiency, pollution control, and other aspects of combustion. 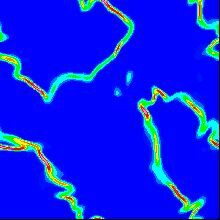 The images below are from direct numerical simulations (DNSs) of turbulent mixing and subsequent reaction. DNSs involve no models and are often considered exact, but they are limited to simple problems. The flow here is so simple that the reaction involves only two gasses (red and blue) and gives off no heat. Yet it tells us a lot about mixing. 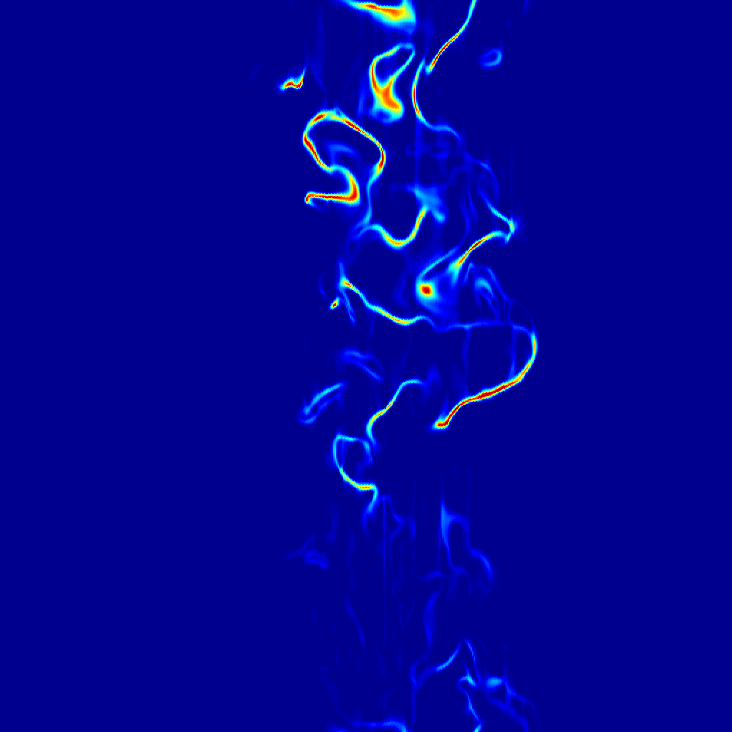 Turbulent mixing between read and blue fluid. Thin zone where reaction occurs. 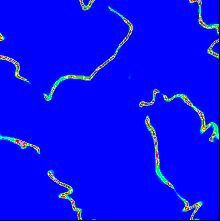 The images below are slices from DNSs in which a blob of fuel reacts with oxidant in a one-step, irreversible reaction. 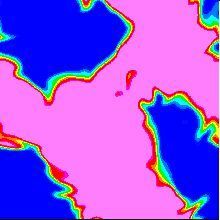 The flow is incompressible, and the fluid properties are constant. The plots show that the reaction zones are thin, even when the reaction is isothermal, and become thinner when the reaction rate depends on temperature. 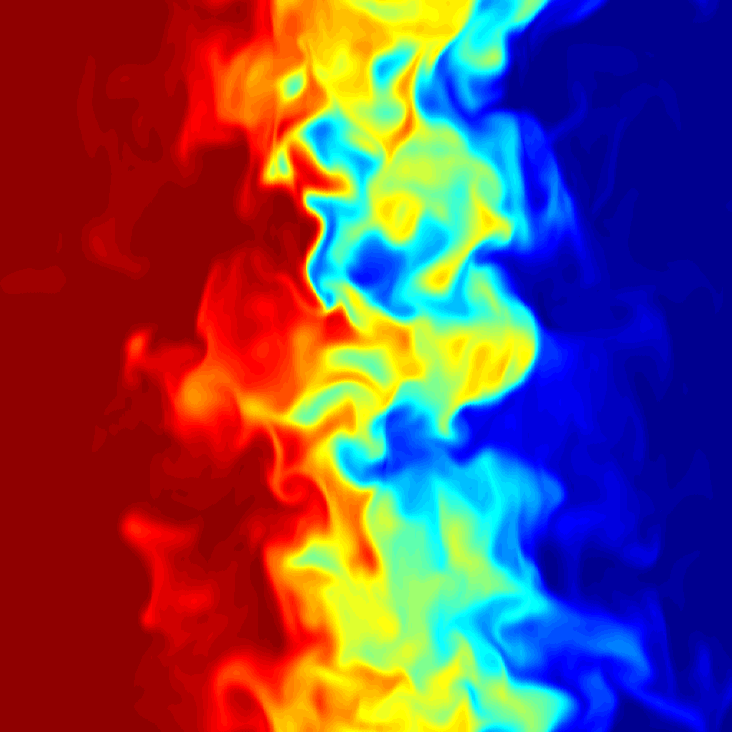 Because the reaction zones are so thin, modeling techniques involving averaging, which are common for non-reacting turbulence, cannot be used. The pink fuel and blue oxidant mix. The reaction will occur only where the two are mixed. 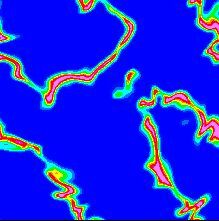 An isothermal reaction occurs where the fluids have mixed. The reaction zone is about as thick as the mixing zone. If the reaction releases heat, the temperature is highest where all the fuel has been consumed. Many species react faster at higher temperature. The reaction zones are very thin, since the reaction needs fuel, oxidizer, and high temperature to occur.